When I saw this balloon wreath Lisa G hung on her front door for her Seuss-y Party, I thought it was the perfect way to welcome her guests. I also wanted to know how she made it. Lisa put together this simple tutorial on her blog Blissful Chaos, and let me repost it, so thank you, Lisa! Lisa made this sweet balloon wreath for Landon's Dr. Seuss party using the same wreath and a lot of the same balloons from her Susan's baby shower. How great to find decorations that can be used over and over again! Leave the plastic on the straw wreath to prevent shedding. Take a balloon and twist the neck, inserting it into the middle of the greening pin. Push the greening pin into the wreath and press in tight to prevent floppy balloons. Continue all the way around the wreath until the entire wreath is covered! 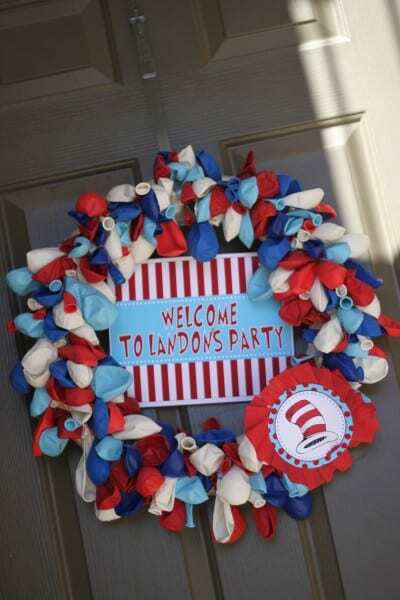 Lisa wanted to add a little something extra to Landon's wreath so she used the "Welcome" sign and Dr. Seuss Cat in the Hat symbol from the printable package she got on etsy from Dimple Prints. How sweet!! Thank you, Lisa, for this tutorial. I think balloon wreaths are so festive and fun! Check out more of Lisa's Dr. Seuss party here and see all the other personal elements she added. Where did you get the sign and the Dr. Seuss Cat in the Hat cut out at?